The Tex-Mex titan continues to aim for McDonald's share of fast-food breakfast sales. If you don’t have to time to make chicken biscuits at home for breakfast (but come on—you totally have time), there is one fast-food chain that will soon vie for your dollars with its own spin on the classic sandwich. According to the Associated Press, Taco Bell is ditching the much-ballyhooed waffle taco concept this week and replacing it with a “biscuit taco.” The move is part of the chain’s ongoing quest to dominate the fast-food competition during the morning. The menu item features a chicken tender wrapped up in a folded biscuit—so basically, a chicken biscuit in the mold of Bojangles’ or Chick-fil-A. If customers would prefer cheese, eggs, and sausage, they can swap in those fillings instead. 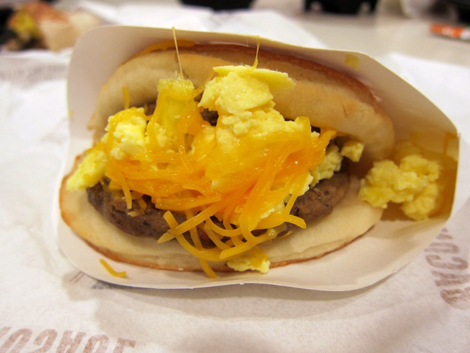 Taco Bell isn’t banking on the biscuit taco alone to pull it level with McDonald’s, though. The company also plans to launch a delivery service and a taco whose shell is made entirely of Fritos to help it compete with the burger-slinging titan.